The CUP extension Recology fought so hard for and took the county to court over (and won) expired on 7 December 2016. The Jungo dump is no more. To be honest about it, this is not a great victory for NAG or the citizens of Humboldt County. Granted, we all made a lot of noise and made our feelings known and we all deserve great credit for that. Thank you each and every one. But there would have been a dump out Jungo Road had it not been for the self-inflicted wounds and subsequent implosion of Recology itself. Not only did they fail to live up to the terms of the CUP, the details of which are buried somewhere on this site and FB, but they never secured even one contract to haul California garbage into Nevada. Yes, it could have been worse….a lot worse. Lessons learned: PAY ATTENTION. Read and investigate HCC and RPC agendas. Show up at commission meetings–participate if possible. Get to know your representatives and ask questions. Suggestions: Attend commission meetings when possible, but in place of that, petition local authorities to broadcast meetings over local TV or via podcasts on the internet. At least four Nevada counties already do this, possibly more…Clark, Washoe, Douglas and Elko. HCC meetings are held during normal business hours when everyone is at work and can only attend by taking time off. RPC meetings are usually held once a month at 5:30 pm, but that doesn’t leave much time for travel after work. Looking around, it doesn’t seem like times, places or agenda items are readily posted for the RPC on the county website. Being largely unaware was how all this dump business got started in the first place. If that doesn’t convince you, then take a look at what landed in Smith Valley, NV surrounded by homes whose owners found out too late what was coming down the pike: https://www.facebook.com/sossmithvalley/ That’s right, a CAFO dairy of roughly 7200 head of cattle on 150 acres. How would you like it if that happened to you? There have been some encouraging things associated with the proposed dump. Who could have predicted overflowing commission meetings? Picketing at the courthouse and lots of letters to the editor? The dump has motivated people to become more involved in their community. Time and the natural flow of events were probably the main factors, but the dump undoubtedly helped. The makeup of the HCC and the RPC has changed. In fact, as of this writing, women now head these bodies. Hopefully, going forward more people will become actively involved. EPILOGUE: It’s been a looonnggg smelly ride and we’re glad it’s over. Hard to believe we’ve been at this since August 2009. Time flies when you’re having fun….or something like that. Humboldt County should consider itself very lucky in that it dodged a big, smelly pollution bullet known as the Proposed Jungo Landfill. But don’t worry, there are lots more bullets to dodge out there. Hopefully people, all of you, will be paying very close attention and nip any future unwanted projects in the bud. Well, as Keillor would say, that’s it from Lake Wobegon, where all the women are strong, all the men are good looking, and all the children are above average. Thanks Tracy and all the rest of you….you know who you are. The headline says it all, but you can read about it here. We will see if this fine sticks or is amended somehow. You can read all about it here. UPDATE: Seems as though all engineering plans don’t go as expected. It would be interesting to know if Recology used the same engineering firm at the Yuba Sutter Landfill as they did for Jungo. A more thorough explanation of the situation may be found here. Drainage leaving the landfill enters the Yuba River, which then flows downstream into the Feather River, the Sacramento River and the Sacramento-San Joaquin Delta. Along the way, those waters serve as a drinking water supply to more than a million residents of the greater Sacramento region, as irrigation water for farms and as habitat for protected fish species, including salmon. In the meantime, the picture below is what the proposed Jungo site looks like after a decent rainfall. Information about the conflict between NDEP, JLII & NNL&R! Other Information and upcoming meetings. This post has been reprinted here from a Facebook entry. Trying to say the same thing a different way may tend to confuse some folks, and since this gets kind of confusing anyway, one post says it all. Well, well, well. It’s back. As you all may recall, we left the Jungo Road Landfill in limbo after NDEP approved the final permits in 2012 for Recology to move ahead. Humboldt County hired legal resource, April, 2013, to negotiate the host agreement in good faith. As time marched on, Humboldt County discovered Recology was never able to negotiate a lease with New Nevada Resources, so that the landfill could be built and operated. Now, New Nevada Resources is asking the county to move ahead to negotiate a host agreement with them. New Nevada Resources is not named on the Humboldt County Conditional Use Permit; and not named as the Operator on the NDEP permits. Seems to me there are many actions that should be taken before asking the County to spend time and money negotiating a host agreement. It appears New Nevada Resources will begin working on that with the NDEP. The permit does state ownership of operations can be transferred assuming the new owner can demonstrate financial responsibility. 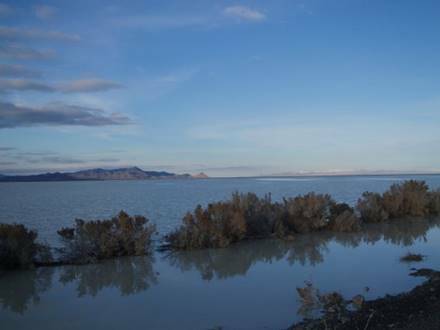 See current permit here: http://ndep.nv.gov/bwm/docs/jungo_permit_final.pdf. New Nevada Resources is privately held, and speaks to the beauty of Nevada land with a business emphasis on solar, wind and geothermal. Doesn’t sound like a want to be landfill operator to me. Sounds like the kind of positive business we’d want in Nevada vs. a huge dump of non-recyclable waste over an active aquifer. Web site: http://www.newnevadaresources.com/new-nevada-resources-about-us.asp While they are pro-development and state they will work with many industries for long term profits, surely a huge landfill isn’t considered a sustainable source of profits. Even Recology has publicly stated that landfills aren’t the ticket, recycling is; as states like California mandate the reduction of non-recyclable waste. • What about County question 1- 2011? This was passed by approx. 70% of voters indicating the will of the majority of citizens intent to not have this landfill or any refuse disposal site other than what is needed to satisfy the requirements of the residents of the county. Why is it ASSUMED the Jungo Landfill is not subject to this? Has any independent legal review (outside of Humboldt County or Recology) weighed in on this? • Is New Nevada Resources aware of the holes in the business case justifying this project or Dr. Lee’s environmental report that the NDEP poo-pooed? • What will New Nevada Resources’ business model be? Will they have business partners? Are they looking to get waste from other than CA? Different types of waste? If yes, more permit changes. Will they turn around if/when a host agreement might be reached and sell the dump back to Recology? Maybe to another entity the county and NDEP is not aware of? • The conditional use permit (CUP) for this project was issued in 2007 for 3 years. Recology did nothing. In 2011, the courts ruled the CUP would be extended 5 years, until December, 2016. Recology, again, was unable to move anything ahead once they received the state permit. In other words, New Nevada Land has less than two years to re-visit all permits and START the operation of the landfill. This does not mean start construction or to begin negotiations with operators but to actually start receiving waste. This is not realistically feasible. Does New Nevada Resources have contracts for acceptance or hauling of refuse? Do they have agreements with Union Pacific Railroad to haul the waste? Will they be able to haul waste thru California to Nevada borders without being required to perform an environmental impact study as Recology was required to do from San Francisco to the Ostrum landfill? If the dump is not up and running by Dec. 2016 and the county refuses to grant another extension, what will New Nevada Resources do? It’s well past time to dump this dump. The economics aren’t positive, the environmental issues are real and the people have spoken. If the Commissioners are still afraid of being sued as individuals performing in the capacity of an elected official, get a real legal opinion on this outside the county. And do your job based on what the citizens have asked you to do time and time again. Nip this in the bud today. You can call or email the Commissioners, or attend the Jan 5th meeting to express your views on this recent development. And yes, this is a picture of the Jungo Playa flooded during the winter. Of course, the NDEP says this never happens. Update: After a lively discussion, this matter was tabled pending the resolution of various questions, some of which have been outlined above. Stay tuned! It seems that Recology has not been too successful in landing new contracts for garbage disposal, but additionally they may have problems retaining one contract they do have. Now one California county is trying to find a way out of a 20 year agreement with Recology amid allegations of misconduct. Click here to read the details. UPDATED: Mandatory trash pickup no longer mandatory. Read all about it here, and don’t expect any different for Humboldt County should the Jungo Landfill ever be built. THE TRUTH FINALLY COMES OUT, AND FROM NONE OTHER THAN RECOLOGY! “In the waste industry, the big money has been made putting solid waste in landfills. To me, that’s not waste management: It’s just putting waste in a hole in the ground and hoping nothing goes wrong. If you can put waste back into commerce, that’s much smarter.” Michael J. Sangiacomo, president and CEO of Recology. And to think that for the last several years Humboldt County has been assured by Recology and NDEP that nothing will go wrong. Of course, if something does go wrong, NDEP will be there, right? Someone has been lied to. Humboldt County, NDEP, certainly Michelle Lodge who wrote this story for not doing the research necessary to ask the tough questions. Questions like: If landfills are such a thing of the past and your company is so environmentally conscious, why are you building a huge landfill in Nevada designed to last for ninety plus years, especially when seventy percent of the residents don’t want it? 15. 10:40 a.m. The procedure to be used by Humboldt County in negotiating the Host Community Agreement with Jungo Land & Investments, Inc. for the Jungo Landfill, the designation of a lead person for contact during negotiations, the retention of an expert to assist in negotiations, and the process of hiring such an expert – Discussion and for Possible Action. This meeting will take place on November 13, 2012 at the Courthouse Commission Meeting Room at 10:40 am. Opinions/Comments/Discussions/Videos/Pictures/ all postings should not be construed as representing the views or opinions of Nevadans Against Garbage (NAG); but are the sole view of the individual posting the material. Material posted on this site by commenters has not been Fact-Checked. Readers are encouraged to check for facts in formulating their opinions. Please remember the Facts are the Facts! Click here to view the current month's events calendar.